People attend a vigil in Albert Square in Manchester, after the city in northwest England absorbed the worst terror attack on U.K. soil since 2005. 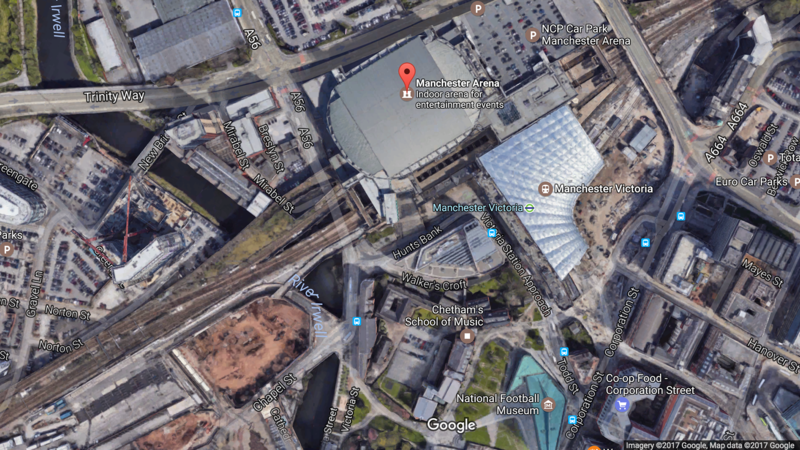 A terrorist bomber struck in the center of Manchester, police say, in the area between the exits of Manchester Arena and the Victoria Train Station. People leave Manchester Arena in England on Monday night following an explosion that killed at least 22 victims and wounded dozens more. A woman looks at flowers left in Manchester's St. Ann Square on Tuesday, one day after a bomber carried out an attack at the end of an Ariana Grande concert in the city. 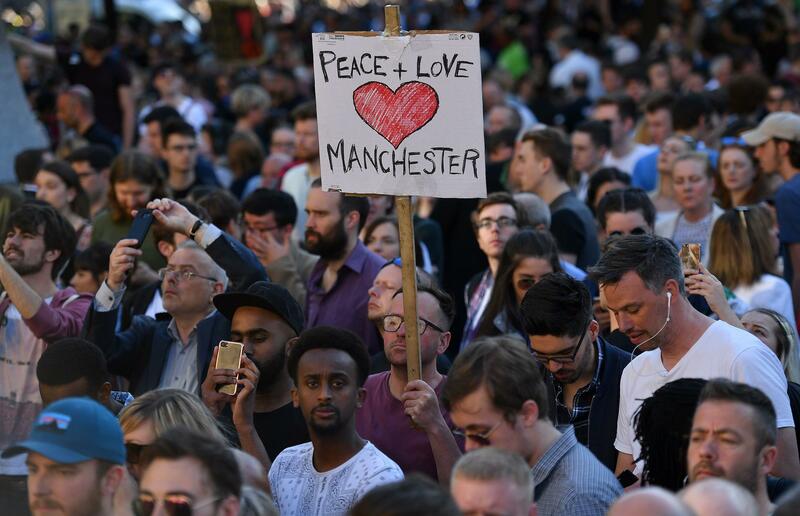 Thousands of people packed Manchester's Albert Square for a vigil Tuesday evening, mourning those who were lost, praising emergency workers for their help and vowing not to be intimidated by the threat of terrorism. More than 18,500 people have donated to a fundraising page that the Manchester Evening News set up to benefit victims, which hit the goal of £500,000 ($650,000) in less than 12 hours. Monday night's concert had drawn thousands of children and young people — many of whom were trying to leave when the blast hit. On Tuesday morning, some parents were still trying to determine the status of loved ones who were at the American pop singer's show. While an official list of victims has not been released, those who died include an 8-year-old girl, an 18-year-old college student and a man in his late 20s. Nearly 60 people had injuries severe enough that they were taken to hospitals. Authorities have made at least one arrest. On Tuesday, the Greater Manchester Police tweeted, "With regards to last night's incident at the Manchester arena, we can confirm we have arrested a 23-year-old man in South Manchester." ISIS has claimed responsibility for the attack, via a statement issued Tuesday that promises more bloodshed, according to jihadist-monitoring group SITE. It's not yet known what kind of ties the bomber may have had with the group. The explosion struck an area between Manchester Arena and the adjacent Victoria Train Station. Police say the first report came in at 10:33 p.m. local time — a time that seems to have been chosen because it meant crowds of concertgoers were starting to head home from the arena, which seats around 21,000. "A bang went off, and everyone stopped and screamed. ... We basically hit the deck," witness Josh Elliott told BBC Radio 5 Live. "It was bedlam ... it was horrific. We got up when we thought it was safe and got out as quickly as possible. People were just crying and in tears. ... Police cars were everywhere." The morning after the bombing, emergency response personnel were still working in the area of the attack, police said in urging people to stay away from the arena. On Tuesday morning, a security alert prompted an evacuation at the city's Arndale shopping center, further rattling nerves in Manchester. Police say a man was arrested, adding, "This is not currently believed to [be] connected to last night's attacks." In addition to at least one arrest, police tweeted Tuesday that they've "executed warrants, one in Whalley Range, and one in Fallowfield, where a controlled explosion took place." Those areas are next to each other, roughly 5 miles south of Manchester Arena. No further information was released about the activity. Immediately after the attack, police received more than 240 calls about the blast. Investigators are asking people who were at the concert to share images and footage from the scene if they believe it might help the investigation. They're also seeking any dashcam video recordings that drivers might have from 8 to 11 Monday night. "The attacker, I can confirm, died at the arena," Greater Manchester Police Chief Constable Ian Hopkins said at a news conference. "We believe the attacker was carrying an improvised explosive device, which he detonated, causing this atrocity." More than 400 officers were working on the investigation, according to Manchester police. "The bombing marks the 13th deadly terrorist attack in Western Europe since the beginning of 2015," NPR's Greg Myre reports, "and overall, more than 300 people have been killed. ISIS has been linked to most of the attacks." Police say at least 22 people died and that 59 of those wounded were taken to eight hospitals in the Manchester area. Prime Minister Theresa May said, "We know that among those killed and injured were many children and young people." Officials have not released a list of those killed, but their identities are beginning to be reported by British media, citing confirmation from families and schools and on social media. Three of the people who lost their lives as Saffie Rose Roussos, 8; Georgina Callander, 18; and John Atkinson, whose age has been reported as 26 and 28. The concert had drawn Ariana Grande fans from across Northern England and Scotland, NPR's Frank Langfitt reports. He says parents who had dropped teenagers off at the show have been scrambling for information; police have posted a phone number for people to check on the status of their loved ones. "It would appear that this was targeting kids," Frank said, "and I cannot remember something recently like that actually happening." He added, "It feels different." 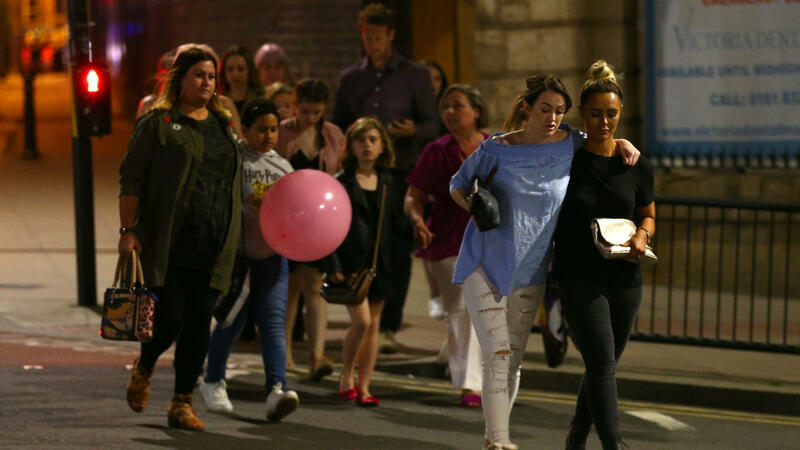 From Manchester, NPR's Soraya Sarhaddi Nelson reported this morning, "There's still a lot of chaos here because some of the concertgoers haven't been found." The attack is the deadliest terrorist strike in the U.K. since suicide bombings hit London's Underground in July 2005. More than 50 people died in that coordinated assault. "I can confirm that the man suspected of carrying out last night's atrocity has been named as 22-year-old Salman Abedi," Hopkins said Tuesday afternoon. Authorities have not released any details about the suspect. The Telegraph reports that Abedi was born in Manchester in 1994 after his family fled the regime of Moammar Gadhafi in Libya. The newspaper adds that they lived in the Fallowfield area — one region of Manchester that saw police activity Tuesday. Police blew open the door at Abedi's house in Fallowfield, The Manchester Evening News reports, posting a neighbor's video of the operation. "All acts of terrorism are cowardly attacks on innocent people," May said, "but this attack stands out for its appalling, sickening cowardice — deliberately targeting innocent, defenseless children and young people who should have been enjoying one of the most memorable nights of their lives." May later announced the U.K. would be raising its terror threat level to "critical" — the highest level on the country's alert system. "It is a possibility we cannot ignore that there is a wider group of individuals linked to this attack," May said, adding, "This means that their assessment is not only that an attack remains highly likely, but that an attack may be imminent." It also means the British military will be supplementing the country's police force throughout the country. U.K. Home Secretary Amber Rudd said, "This was a barbaric attack, deliberately targeting some of the most vulnerable in our society — young people and children out at a pop concert." Grande tweeted: "broken. from the bottom of my heart, i am so so sorry. i don't have words." President Trump, speaking during his trip to Bethlehem, offered prayers for Manchester, saying, "We stand in absolute solidarity with the people of the United Kingdom." "So many young, beautiful innocent people living and enjoying their lives murdered by evil losers in life. I won't call them monsters because they would like that term. They would think that's a great name. I will call them from now on losers, because that's what they are. They're losers. And we'll have more of them. But they're losers. Just remember that." 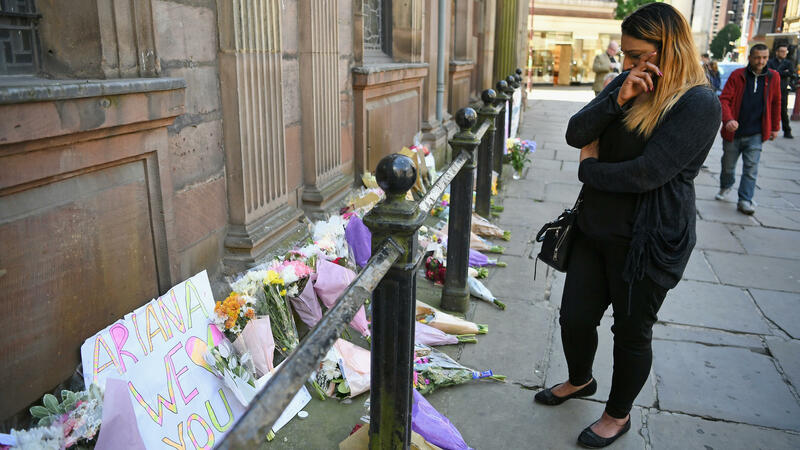 "We are grieving today, but we are strong," Manchester Mayor Andy Burnham said Tuesday. A huge crowd gathered in the city's Albert Square for a vigil that began at 6 p.m. local time. At the vigil, the crowd gave a loud ovation after hearing poet Tony Walsh read his ode to Manchester titled, "This Is The Place." They also observed a moment of silence for the victims and their families. "This is an unbelievable turnout," Bishop of Manchester David Walker said of the huge crowd. "It shows that they are the few, but we are the many. We are Manchester." Walker added, "We are the successful world city we are because people have come from all parts of the world, and we have welcomed them, and they have made their homes here — and they have become Manchester, too." The attack sparked a "high response" from people wanting to donate blood, prompting the National Health Service to say, "We have all the blood required at the present time." The agency had initially asked for potential donors to register but then cut off new registrations, again citing an overwhelming response. "A lot of people are coming and bringing sandwiches and pastries, and showing their support," Soraya reports. "There definitely is a solidarity here and a protectiveness and also a resilience." British education officials say the attacks could have wide effects at schools, and that teachers should take students' reactions into account in deciding whether to hold exams. While the area around the attack remains cordoned off, police said Tuesday, "We want to remind people that Manchester will not be defeated — the city is open for business."